New Delhi : Jaipur Metro Rail Corporation (JMRC) has been conferred with urban mobility initiative for Metro Project (Phase 1 A) in Jaipur. 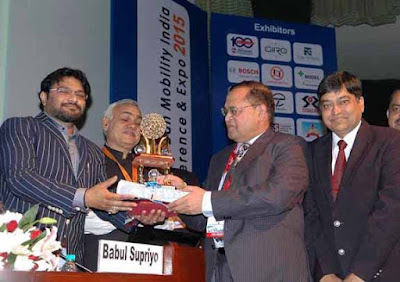 The Jaipur Metro CMD Nihal Chand Goyal received the award from Minister of State for Urban Development, Housing and Urban Poverty Alleviation Babul Supriyo. While, the Gurgaon Police and Bhopal Traffic Police have jointly won the Ministry of Urban Development’s Urban Mobility India Award for the year 2015 for “Best Initiative for Improved Road Safety”. Gurgaon Police was awarded for their ‘Let’s Talk About Road Safety’ campaign while Bhopal Traffic Police’s ‘Behtar Traffic-Behtar Bhopal’ has won them the laurels. Babul Supriyo, Minister of State for Urban Development today gave away various Urban Mobility Awards on the concluding day of 4-day long Urban Mobility India Conference. ‘Best City Bus Services’ Award was jointly presented to Chattisgarh State Urban Development Authority and Raipur Municipal Commissiner and Karnataka State Road Transport Corporation. Municipal Commissioner, Raipur received the Award for ‘Cluster Based City Bus Project of Chattisgarh. Karnataka State Road Transport Corporation was honoured for organizing city bus services in small and medium towns in the state. Rajkot Municipal Corporation’s Bi-cycle Sharing Project has won the Best Non-Motorised Transport System Award. ‘Best Intelligent Transport System Project’ Award was presented to ‘Computerised Duty Schedules’ of BEST, Mumbai. Sikkim Transport Department got ‘Commendable Initiative’ recognition for city bus services. Similar recognition was conferred on Jaipur Metro Rail Corporation for Metro Project (Phase 1 A), Indore for cycle sharing project, NOIDA for introducing High Way Traffic Management System for NOIDA-Greater NOIDA Gautam Buddha Expressway and Coimbattore Municipal Corporation for its Car Free Sundays initiative. On this occasion, Jaipur Metro CMD NIhal Chand Goyal, said that, "we got this award for successful operations of Jaipur Metro in a short period of 5 month, which will be a milestone for new metro rail services." Jaipur Metro Director (Project) Ashwani Saxena, director of operations C S Jeengar and other officials were also presented on the occasion.